PHOTO: The fjords of Norway’s west coast form a majestic combination of mountain and seascapes. The collaboration between VisitNorway and Disney Films based on the movie “Frozen,” which opened last November, returned dividends for both. By January, “Frozen” had already reaped $865 million, making it one of Disney’s most profitable films ever. Fjords, stave churches, folk outfits and castles placed the mythic kingdom of Arendelle squarely in Norway. 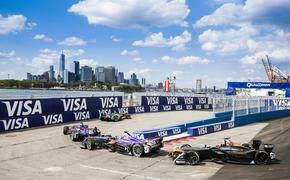 Since it opened, American hits on VisitNorway’s site have tripled. Likewise, flight searches from the U.S. to Norway are up 153 percent. It seems Disney’s pixie dust has spurred interest in a more nuanced explication of Norway. The following is just a sampling of attractions, activities and destinations in Norway that may be of some help in finding things to do and see. Norwegian tourism begins in Oslo. Oslo itself began at the 700-year-old Akershus Fortress, home of the Norwegian Resistance Museum. The museum tells the story of one of World War II’s most ferocious insurgencies against Nazi Occupation. Norwegians were the first Europeans to land on North America and the first to reach the South Pole. The FRAM Museum, the Viking Ships Museum and the Kon Tiki Museum and all pay tribute to the Norse spirit of exploration. The FRAM Museum features the wooden icebreaker that went farther north and south than any other surface ship in history. It made three polar expeditions, including Amundsen’s 1912 journey to the South Pole. 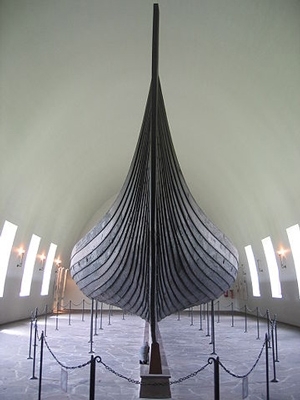 The elegant ships of ancient Norse explorers are housed in the Viking Ships Museum. The Kon Tiki Museum also puts that bold spirit on display with its artifacts from the amazing voyages of Thor Heyerdahl. For most people, the arts in Oslo begin with the Munch Museum, which is dedicated to the life and work of Norway’s most famous artist, Edvard Munch, painter of “The Scream.” The Munch Museum will get a new home in 2018. The National Museum contains the Museum of Architecture, the National Gallery and the Museum of Decorative Arts and Design. Oslo’s Vigeland Park, among the world’s greatest art projects, is the work of Gustav Vigeland. Over a lifetime he filled the park with 212 life-sized statues, groups and reliefs in bronze, granite and wrought iron depicting an almost complete inventory of the human condition. One of Oslo’s newest attractions is in one of its oldest parks: the Ekebergparken. This 19th-century park just opened a sculpture garden last September that features 30 works paying homage to women. The sculpture park’s artistic spectrum ranges from Rodin and Maillol to Dali and Louise Bourgeois. The Opera House overlooking Oslo Fjord invites people to climb all over it, to treat its snow-bright roof as a park. Home to the largest solar panel in Europe, the building’s iconic shape and glaring whiteness evokes an iceberg. The new Astrup Fearnley Museum opened on the island of Tjuvholmen in 2012, in a new building designed by Renzo Piano. The museum features works by Jeff Koons, Takashi Murakami, Damien Hirst, Cindy Sherman, Richard Prince and many others. When Alfred Nobel created his prizes back in 1901, he directed the Nobels for literature, physics, chemistry and medicine to be awarded in Stockholm, but the Peace Prize was to be given in Oslo. The Nobel Peace Center was opened in 2005. The museum chronicles the significance of the Peace Nobelists with interactive presentations and conceptual art installations. The Holmenkollen Nordic Skiing Arena is located on a mountain on the outskirts of Oslo and includes a ski jump, ski museum and ski simulator. This facility, though it was recently modernized, was the setting of the 1952 Winter Olympics and remains one of Oslo’s most popular attractions. Oslo is applying to host the Winter Olympics in 2022. We recommend an Oslo Card to your clients, as Oslo is a pricy city. The card provides free entry to dozens of museums and attractions, free travel on public transport in city center, a free lunch cruise and several discounts. The card comes in 24-, 48- or 72-hour versions. Spitsbergen, the largest island in the Svalbard archipelago, is home to polar bears, reindeer and arctic foxes, as well as walruses, seals, whales and myriad seabirds living in high mountains on icebergs and glaciers. Visitors explore the region via expedition boats, dogsleds and snowmobile safaris. Svalbard is also a wonderland for kayakers in summer. Other interesting sites in northern Norway include the Lofotr Viking Museum on Borg in the Lofoten Islands, which features the largest Viking longhouse ever found. The longhouse was reconstructed in its entirety. Both the mead hall and the section for accommodation have been re-created as accurately as possible, down to authentic handicraft and decorations. In a nearby inlet lies the Viking Ship, a replica of the Gokstad Ship. The island of Moskenes features traces of settlements dating thousands of years back in time. The gigantic Kollhellaren Cave in Refsvika is a coastal cavern with approximately 3,000-year-old cave paintings. The Atlantic Road is part of the 22-mile National Tourist Route between Bud and Kårvåg. The Atlantic Road is just one incredibly scenic five-mile stretch of the route. It lays a ribbon across low bridges that jut out over the sea, linking the islands between Molde (famous for its annual jazz festival in July) and Kristiansund in the western fjords. The Wolf Camp in Norway’s Polar Zoo in Bardu, Troms, was founded to ensure better life for wolves in captivity, for educational purposes and to give visitors the opportunity to experience wolves. The wolves of Wolf Camp do not fear human beings and enjoy human company as part of their environment. Bergen looks out over the Atlantic from the West Coast of Norway just as Oslo, at roughly the same parallel, looks out on the Oslofjord from the East Coast. 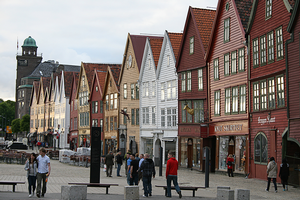 Bergen is the gateway to the fjord experience in Norway. The city's centuries-old streets and alleyways are animated by brightly painted wooden houses. The popular nine-hour tour “Norway in a Nutshell” departs from Bergen. A perfect recommendation for clients who aren’t going on more in-depth journeys or cruises through Norway, the trip comprises a fjord tour, the Bergen Railway and Flåm Railway. The Flåm Railway (Flåmsbana) runs a 12-mile scenic journey past waterfalls, in and out of snow-capped mountains and ending up by the Aurlandsfjord. It winds its way from Myrdal to Flåm and is one of the world's steepest railway lines on normal gauge. The trip between Myrdal and Flåm takes about one hour. 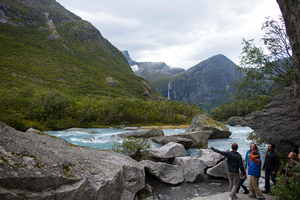 The UNESCO-protected Geirangerfjord is surrounded by snowy mountains, wild waterfalls and lush, green vegetation. The fjord affords cruising opportunities, kayaking, hiking and more. 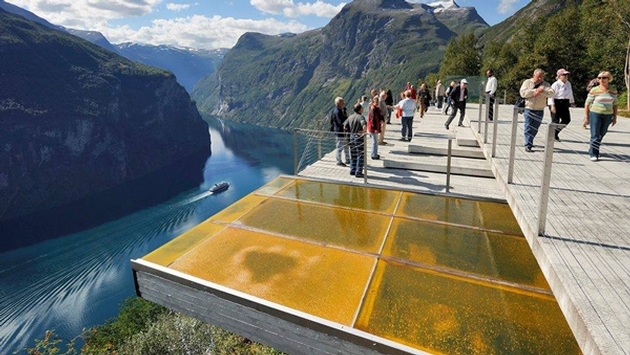 The Geirangerfjord is visited by 150 to 200 cruise ships and more than 700,000 tourists each year.